Is your elderly loved one experiencing signs of stress or trauma about particular events in their life? More seniors are developing anxiety, but often family caregivers are not familiar enough with the signs and symptoms of anxiety. If you want to reduce the likelihood of their aging loved one developing an anxiety disorder, it’s important to learn what causes anxiety and how you can help. Elder Care Rochester NY – What Causes Anxiety in Elderly Adults and How Can I Help? Anxiety is a mental health condition that centers on feelings of fear or worry that interferes with a person’s life. In many people, anxiety can become so intense that it affects their day-to-day interactions and can even have a negative impact on their physical health. Symptoms of anxiety in seniors often manifest as excessive concerns, insomnia, rapid heartbeat, tense muscles, feelings of fear and worry, paranoia, depression and avoiding people and social events. What Can Trigger Anxiety Disorder in Elderly Adults? While anxiety can be linked to several genetic components, often when it develops later in life it is connected to certain events or conditions. Some of the more common triggers for an anxiety disorder include trauma, extreme stress, grief, another mental illness, and rapid changes that seniors face. These changes include worrying about finances, declining health, losing independence, loneliness and contemplating their own mortality. If this anxious state continues, it can contribute to chronic stress and further mental health issues. 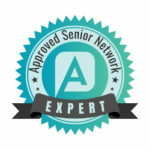 How is Anxiety Disorder Treated in Elderly Adults? If a family caregiver notices that their aging relative has all the symptoms of anxiety, they should connect with a doctor first to rule out any physical issues or medication side effects. They will most likely refer their senior patient to a mental health expert for continuing treatment. Effective treatments usually involve a combination of anti-anxiety medication and talk therapy. While anxiety disorders can’t go away overnight, with time and effort, the aging adult can figure out ways to properly treat it. How Can Family Caregivers Help? In addition to a formal treatment that involves medication and therapy, there are lots of things that family caregivers can do to help. The most important is to help with reducing the aging adult’s stress levels. Many families hire elder care providers to help elderly adults with daily tasks that are growing increasingly complicated. These elder care providers can help seniors with things like light housekeeping, laundry, meal preparation and pet care. If the aging adult is also dealing with other physical health issues, the elder care provider can assist with dressing and grooming as needed. It’s difficult to watch your elderly loved one suffer with stress and anxiety, but you are in an excellent position to make sure they get the help they need. Anxiety disorder without treatment can be a dark cloud hanging over their lives, but with proper help and lots of support, the sun can shine through again and your aging loved one will soon see brighter days.